Brigsby Bear plays like a smash-up between the low-fi amateur filmmaking comedy Be Kind, Rewind and the kidnapping drama Room, although it’s not half as interesting as that bizarre remix sounds. In fact, for a film with such a strange and potentially disturbing concept, Brigsby Bear is curiously light on depth and invention. The film centres around James Pope (Kyle Mooney, who also co-wrote the film), a young man who lives in an underground bunker with two lunatics (Mark Hamill, Jane Adams) posing to be his parents. His main obsession in life is the live action children’s TV show known as Brigsby Bear Adventures, which he watches on VHS tapes delivered to his door each Saturday. However, when James is rescued from his imprisonment and returned to his real parents (Matt Walsh, Michaela Watkins), he discovers that Brigsby Bear Adventures is not actually a real show but a manipulative creation of his fake parents/abductors. Distraught by this news and eager to share his love of Brigsby Bear Adventures with the world, he decides to make a movie to conclude the TV series and perhaps process the trauma of his life. Brigsby Bear combines the well-meaning quirk of Sundance movies with the goofball charm of SNL shorts. However, considering that the film’s concept could easily fuel a horror film (like Room), its flat, optimistic tone is disappointing. For all its inventiveness, Brigsby Bear is an emotionally false film. Aside from all the logical issues with its concept (i.e. how was James’ fake father able to find the time to make one episode per week while also keeping his underground bunker functioning), the main issue with Brigsby Bear is its emotional dishonesty. Much of this can be chalked up to the fact that the entire film is viewed through the lens of James. It bears his optimistic, blinkered worldview. And that’s a problem. 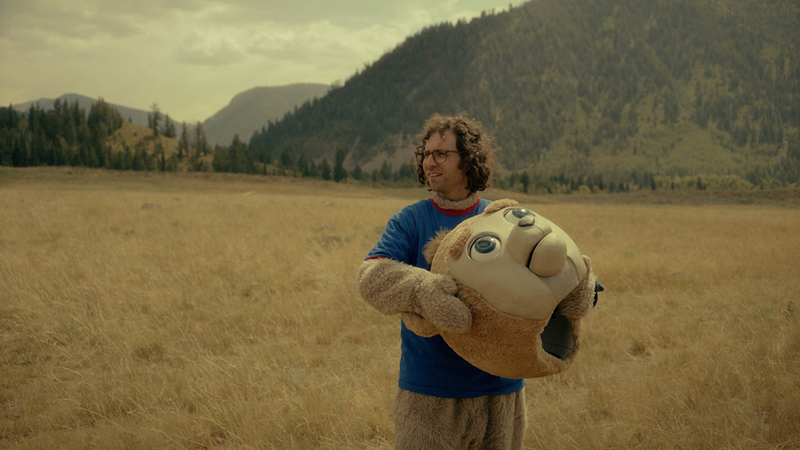 The subject matter of Brigsby Bear is traumatic, and yet the film is more interested in exploring the implications of fandom than actual trauma. I’m not against exploring such dark subject matter in a sunny way—Unbreakable Kimmy Schmidt is a perfect example of how to make a funny show about dark material ring true (and even has a bunker to boot)—but Brigsby Bear never earns its sentimental catharsis because it never truly explores James’ psyche. There’s only one scene where characters even address the fact that the show James is obsessed with was a method of psychological manipulation, and that scene and its moral reservations are quickly forgotten as James (and the film) attempt to woo the world around them with the charms of Brigsby Bear Adventures. It’s true that Brigsby Bear Adventures is amusing in some of the clips we see and that there are people in our world who would become obsessed with such a show, but even discounting the fact that the show is literally the tool of a child abductor, it’s hardly the sort of entertainment to foster healing and unite a community the way the film thinks it would. If the film were more daring, it’d delve into the implications of the fact that beloved pop art (like Marvel and Star Wars) can be used to distract us from the issues of our world, but the film never actively engages with this since such an engagement would distract from the warm, fuzzy feeling the movie is trying to fill viewers with. In fact, as James raves about Brigsby Bear Adventures in scene after scene and infects others with his enthusiasm, the film becomes more about how to be a good fan (to love a property selflessly and feel ownership over it without keeping it to yourself) than about how we identify ourselves by the things we like. In the end, Brigsby Bear reminded me of another lauded Sundance feature: Marjane Satrapi’s The Voices. Both films take on delicate psychological material and flirt with profundity only to settle for quirky charm and unearned catharsis. Like the bear at the centre of it, Brigsby Bear looks cozy and welcoming, but in fact it’s simply a comforting exterior with nothing inside. Directed by Dave McCary; written by Kyle Mooney and Kevin Costello; starring Kyle Mooney, Mark Hamill, Greg Kinnear, Matt Walsh, Michaela Watkins, Ryan Simpkins, Jorge Lendeborg Jr., Andy Samberg, Jane Adams, Claire Danes.